Originally appeared in the September 20, 2012 edition of the Southside Times. Here’s a what I believe is a seldom-used pasta among food enthusiasts: orrechiette, the indented-disc shape of which resembles a small ear. In fact, the word has its root in the Italian “orecchio,” meaning ear, and “etto” meaning small. Pancetta is the Italian, salt-cured version of bacon. You may not readily notice this savory selection at your local market, but go to the deli counter and ask. In other words, if it’s not up front under glass, sometimes they have it in the back. 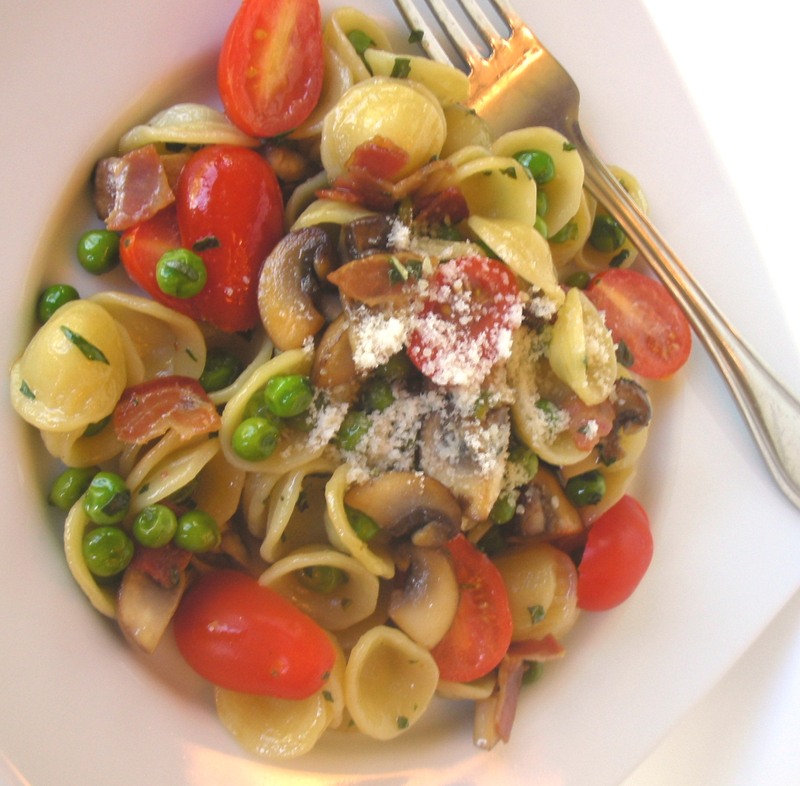 I like adding peas for their sweetness and color, but one of the unique features of orecchiette is its ability to cup or cradle vegetables and sauces. It would be easy to go overboard under that guidance, but keep things simple—a few meticulously handled ingredients with a user-friendly execution. 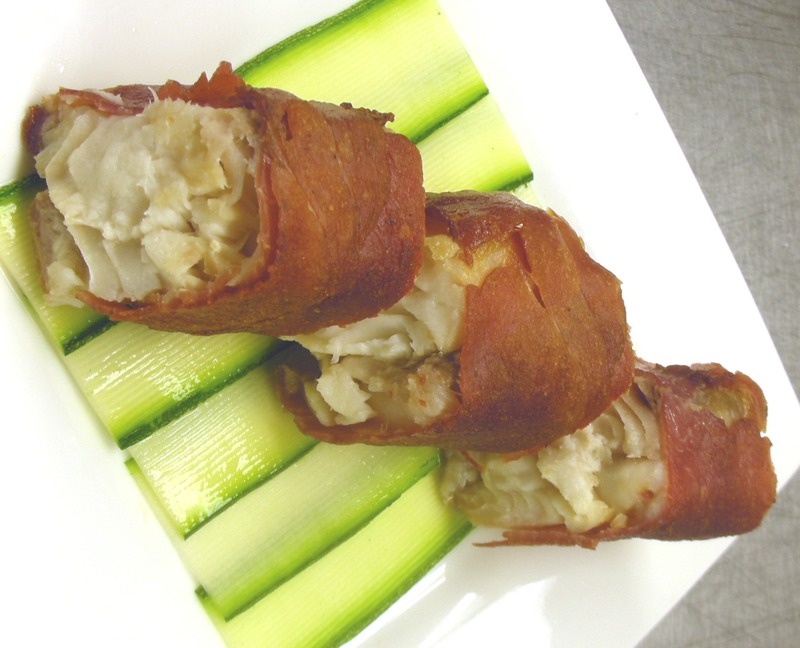 This dish makes for a great, midweek snack, or a gray-day comfort food. So, friends, readers, culinarians, please allow me to lend you these ears. 1. Being a medium stockpot of salted water to a boil; add orecchiette pasta, stirring frequently to prevent sticking. 2. Meanwhile, in a sauté pan over medium-high heat, add pancetta and sauté until crispy; add mushrooms and sauté until slightly tender; add peas. Once peas have warmed, add wine and allow to reduce. 3. Strain orecchiette and add to sauté pan. Add in butter and stir to incorporate. Add tomatoes, adjust seasoning, toss with parmesan and serve. Originally appeared in the June 7, 2012 edition of the Southside Times. For this week’s installment, you’ll be employing a little boiling and a little broiling—the former with the pasta (fettuccine), the latter with the parmesan. 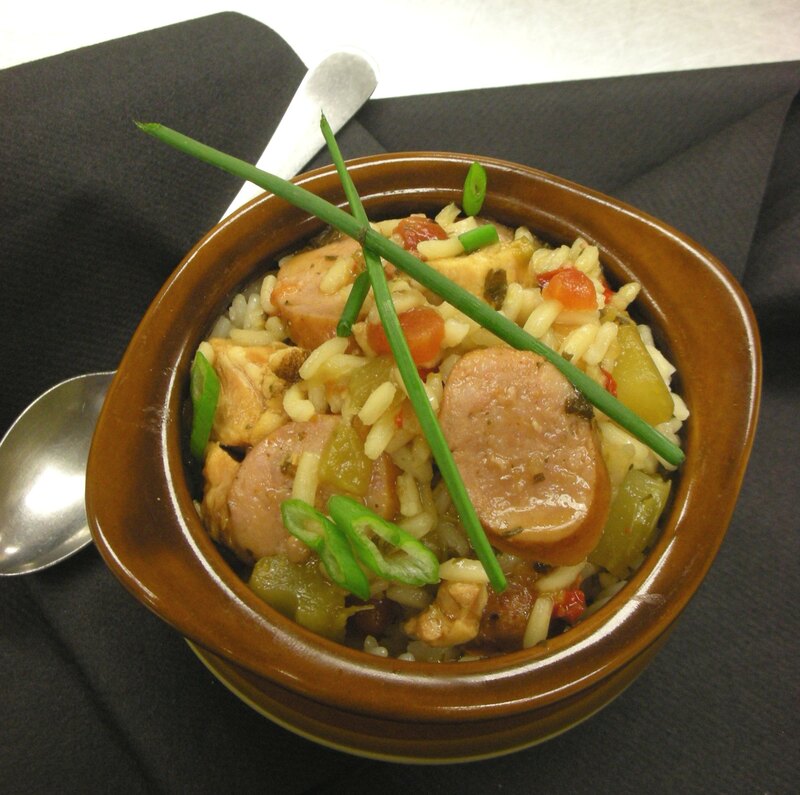 While the protein centerpiece of this dish is the pork (a thick-cut loin cutlet), my favorite part is the pasta. Here, it’s fun to exercise a bit of friendly deception with the asparagus, which is meant to mimic the shape of the fettuccine. This is easy to accomplish: simply place your asparagus (about 6 – 8 pieces for a 2-serving portion) flat on a cutting board, and use a vegetable peeler to shave long ribbons away from the stalk. (I have taken to using vegetable peelers with fine, serrated teeth, which are good for gripping your product; but a good old fashioned peeler should do the trick.) Cut off the delicate tips and incorporate them into the pasta. Now, on to the pork. After grilling or pan-searing you pork, arrange your oven rack closer to the broiler, and crank the broil temp up to about 500° F. before prepping the parmesan along with rest of your ingredients. 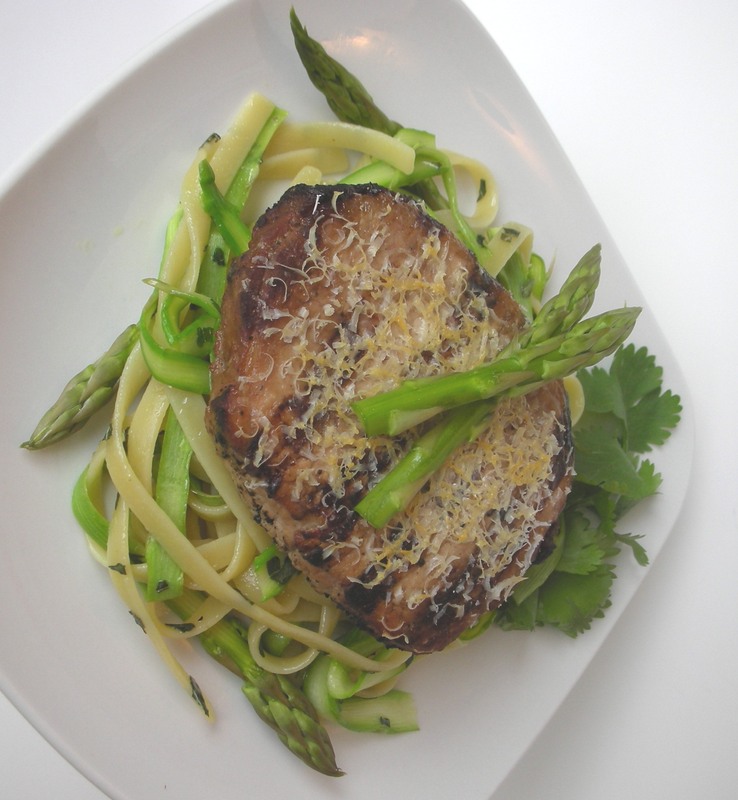 The parmesan pork makes for a nice pairing with the lighter, fresher, asparagus pasta. 1. Season pork chops with kosher salt and cracked black pepper. Using a grill pan or sauté pan, sear pork loin on both sides; afterwards, place in preheated oven (if needed) to finish cooking to desired doneness. Cover chops with aluminum foil and allow to rest as you finish prepping remaining ingredients. 2. Boil fettuccine in salted water. Meanwhile, use a vegetable peeler to shave ribbons of asparagus. Drain pasta. In a sauté pan, gently heat olive oil; add in asparagus and cook briefly; add in pasta, adjust seasonings; add in basil and toss in butter, coating the noodles and asparagus. 3. Evenly sprinkle the parmesan over the top of the pork and place under the broiler. Allow to melt and get crispy. Serve pork over bed of fettuccine and asparagus.